Stormworks: Build and Rescue is an interesting game – or at least it looks interesting. The impression I’ve always had is that it’s a dash of Kerbal Space Program with a side of Jalopy and a topping of the Search and Rescue simulation titles. You know what, I’m pretty clueless as to what it really is, in reality. I’m pretty certain that now is the right time to find out though. Why? Because the game now has even more challenges and has a huge amount of added interactivity thanks to a brand new survival update. What this new update does is add more than the risk of failure to any of your rescue operations, you’re going to be placing yourself in mortal peril too. Dan Walters, CEO of developers Sunfire Studios, believes this will expand the game like never before, adding a whole new motivation for current players and giving new players something truly exciting to jump into. This is as big an update as we’ve ever planned for Stormworks: Build And Rescue, something like the 180th update we’ve put out since we first launched the Alpha a year ago, and the third major update in the last seven months. For the first time, we’re adding a health bar, a multitude of ways for vehicles to get damaged with a real impact on players’ progress, and – of course – death. It’s going to take the processes our loyal players have been making the most of and place them in a mode we think will both add fresh impetus for current players, as well as opening the game up to an entirely new player base, too. All this is achieved by allowing the craft you build, be it Land, Sea or Air, to take damage. Taking damage is far from the only addition in this expansive patch though. The inclusion of ragdoll physics is designed to add a sense of realism to the game, heightening the tension for the player. There is also a push for realism with how fuel and engines work. You now have to worry about how much fuel you are carrying, ensuring you have enough to make it back from your destination. What will truly test your mettle, though, is the inclusion of huge tsunamis that are more than happy to take over the sea in the middle of any mission you may be on. Further quality of life updates have also been made in the form of enhanced visuals and “Scores and scores of tweaks, changes and improvements to almost every element of play” – whatever they may actually be. The damage, the death, the real sense of danger that this update brings to Stormworks: Build and Rescue is hard to condense down into a single statement. The Survival mode alone could easily stand up as a game in its own right. It’s a brilliant example of how you take a solid foundation, and add a new spin on it. The game is enjoying record numbers of players , and we think these new modes and features will bring even more gamers to the world of Stormworks. 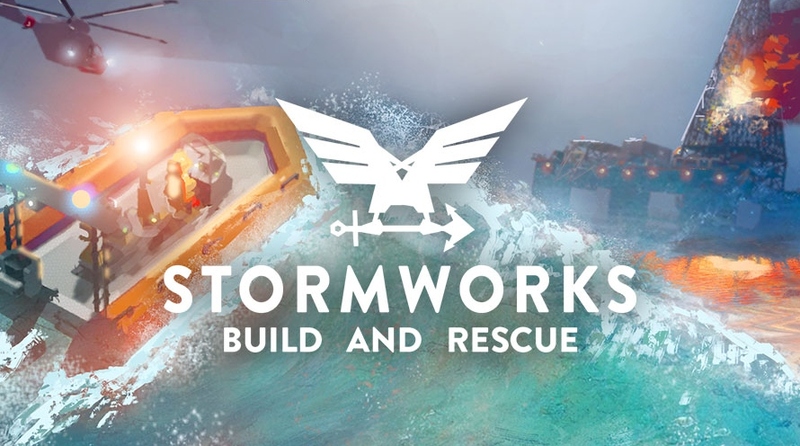 Stormworks: Build and Rescue sees players take charge of their own sea-rescue service, tackling the game’s rich and dramatic physics playground to pull off astounding rescues. Designing unique and adaptable vehicles for land, sea, and air, players’ craft are tested to the limit in a physics driven sandbox simulation, where the vehicle’s performance in a rescue is directly linked to its design. Reacting to events out on the water, Stormworks: Build and Rescue charges players with controlling custom designed, programmable vehicles out into fierce oceanic storms, pulling off thrilling rescues in a variety of challenging crisis scenarios. Each mission calls for an emergency response across the open ocean, island facilities, rigs, and more, with the game’s dynamic weather system and day-night cycle ensuring one rescue is never quite like any other. Best of all for current players and those, like me, who are interested – the new survival update is live right now.